We are great fans of the work of Gerry Anderson and already feature articles on Captain Scarlet, Joe 90, Thunderbirds, Space 1999 and StingRay and we have just learned about a show that was never made The Investigator. Gerry Anderson released the pilot for The Investigator in 1973. It had been shot on location in Malta. Unfortunately it was one of those projects that seemed doomed to failure right from the start and was ultimately abandoned. Combining live actors with 1/3 normal-size puppets, the plot involved two characters John and Julie – their mission to make the world a better place. Their first mission was to stop the evil Karanti from stealing precious objects from a church. The characters were voiced by Shane Rimmer and Sylvia Anderson, the voices of Scott Tracey and Lady Penelope from the Thunderbird series. Peter Dyneley who voiced Jeff Tracy read the part of ‘The Investigator’. Two models from the series are to be auctioned at Sworders auctioneers. 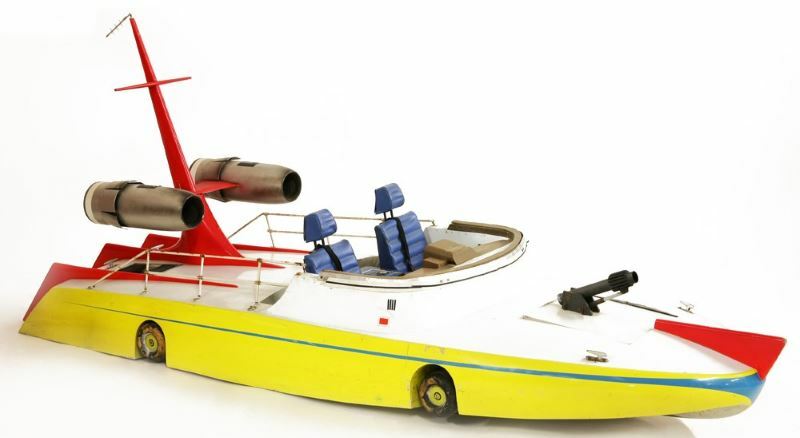 The one-sixth size eight wheel car and speedboat, both featured in the pilot, have been on display at the Toy Museum at Stansted Mountfitchet for a number of years. The models were designed by Reg Hill who created many of the props for Gerry Anderson’s other hits like Stingray and Captain Scarlet, and made by Space Models of Feltham in 1973. The car is fitted with a Honda engine and radio-controlled. The boat has a swivel cannon fitted in the bow and was originally towed for the action sequences. Each is estimated at £6,000-8,000.